With over $169 billion in large scale construction projects on the horizon, Alberta’s already overheated economy is only going to get worse. Alberta’s inflation rate has reached national highs. Housing prices have increased at rates as high as 50% per year in Edmonton and Calgary. Public infrastructure is being built at enormous premiums. Meanwhile, homeless rates are rising across the province, climate change emissions are increasing dramatically, conventional fuels like natural gas are being depleted, and the province is even considering using nuclear power to fuel tar sands development. There is no question the bulk of this boom is being driven by fossil fuels and specifically investment in the province’s tar sands—over $100 billion of the $169 billion in projects slated for development is for tar sands development alone. The desirability of this level of investment is not being questioned by the Alberta government in spite of the high social and environmental costs. This is because that private investment is being seen as an end in itself. However, investment is not a goal; it should be seen as a tool to be harnessed towards achieving social goals. Alberta is lacking in long term societal goals to guide this investment, goals which could include: creating long term quality jobs for Albertans; supporting a green economy; generating long term revenue and sustainability for social programs; ensuring intergenerational equity; eliminating poverty and reducing inequality; creating sustainable rural economies; and improving the quality of life and environment in communities. Unlike Alberta, many oil rich regions have a framework to guide their resource development. To achieve their goals, many have kept their natural resources in public ownership, while others are using tax and royalty or rent capture regimes to maximize the return to the owners. The Alberta government is under-selling Alberta’s resources on the assumption that srtiking a good deal for Albertans would result in companies leaving. But, Alberta is in a very strong strategic position in terms of global oil dynamics. There are four key reasons why Alberta should have confidence that investment will continue to be strong even if the province takes the policy initiatives it needs to maximize the returns to its citizens. Conventional reserves are declining around the world. As conventional reserves for oil and gas peak and decline, the industry is looking more and more towards high risk, high cost oil sources such as off shore. Risks are relatively low for exploration and development in the tar sands; we know where the reserves are and how to get them. Combined royalties and taxes are currently disproportionately low in Alberta relative to other oil producing regions. There is room for those to increase without deterring investment. With the real estate market crash in the U.S., there are a lot of investment dollars looking for a secure place to earn high returns. In this context, an alternate development strategy for Alberta is not only feasible, but necessary; Alberta cannot afford to be giving away its non-renewable resources. 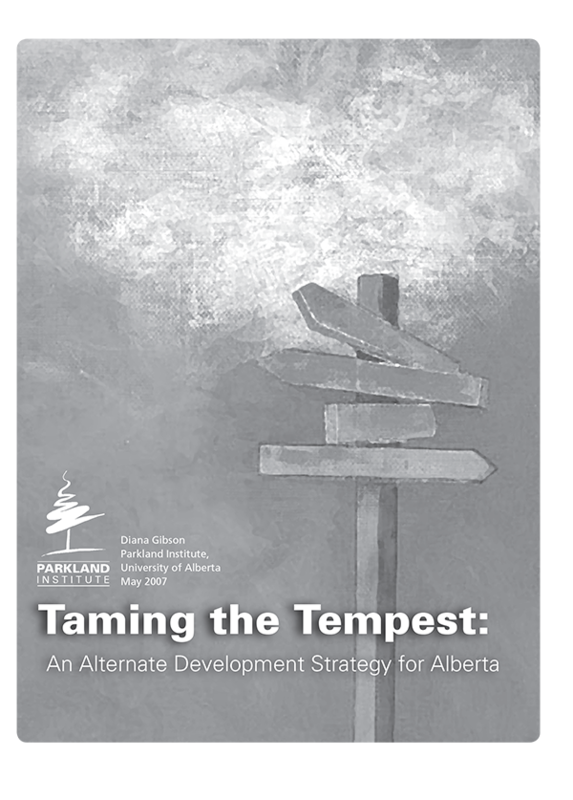 This reports lays out the framework for a development strategy that would slow the pace of investment to allow the economy to catch up, maximize returns from Alberta’s fossil fuels, maximize the processing and upgrading of those resources into higher value products, and put into place a long term plan for using the resource revenues to guarantee a future for the province. This strategy is meant to stimulate public debate on the options open to the government for managing Alberta’s natural resources in the interest of the owners and future generations of Albertans. The scope of this report is limited by time and resources. The report thus focuses on managing the boom in the short and medium term. The strategy is not meant to be comprehensive. It is meant as a first step in sparking debate. Perhaps its most important point is that the crash course we are on is not inevitable. There are a variety of options available to government. Alberta’s economy is overheated, inflation is the highest in the nation, unemployment is at an all time low and workers are being brought in temporarily from abroad. Much of the current boom is being driven by an increase in construction, leaving the province dangerously reliant on construction as a driver. The high concentration of investment will guarantee that the construction boom ends quickly. Even without a price crash like the ones that have caused previous busts, the fall off in construction will leave more than half of the workers currently in the tar sands out of work. Oil prices have almost tripled since the mid 1990s but royalties have not kept pace. Low royalty rates are not due to prices or profits being low. Returns on equity for Canadian upstream oil and gas have risen from the high level of 15.4 percent in 2001 to 22.4 percent in 2005. As the industry makes record profits, the Alberta government received only a 19 per cent share of oil and gas revenues in 2004. And, though already low, the revenues from oil and gas are set to fall. With the shift away from conventional oil and the lower royalties on the tar sands, the provincial government is forecasting that royalty revenues will decline from $11.7 billion in 2006-07 to $7.8 billion by 2009-10. A number of studies by the Parkland Institute and others have shown that Alberta collects much less than other jurisdictions such as Norway and Alaska. Generous estimates are that Alberta collects 58% of available rent from the tar sands while Alaska and Norway collect 88% and 99% of rent respectively. Policies elsewhere include: in Bolivia 82% of all revenues from natural gas go to the government; in Kazakhstan 80% of oil extracted goes to the government in a production sharing agreement; in Abu Dhabi and the United Arab Emirates, the profit margin for companies is limited to $1 per barrel; in Russia the government takes 90% of the value of sales above $25/barrel. In many other countries the rent recovery is 100% because the government does the extraction itself through a national oil company (OPEC countries, Mexico and China). Canada has suffered from its colonial past with the continued mentality of a resource hinterland. Over the last decade and a half, the province has shifted to a heavy reliance on raw resources and raw exports of fossil fuels, agricultural and forest products. An illustrative example is Alberta’s petrochemicals industry, which is suffering from consolidations and plant closures. While employment levels are relatively low for primary and first stage derivative petrochemicals, they increase enormously the more the product is upgraded. The same applies to bitumen. Generally, studies have found that a higher degree of upgrading will increase marketability of bitumen feed stocks. The job and economic returns increase dramatically the more the bitumen is upgraded and refined. It is in Canada’s interest to ensure that those jobs and economic returns accrue to Canadians. However, five new pipelines are being proposed to export raw bitumen to the United States to be turned into high value products. One estimate of the Keystone pipeline alone includes the loss of 18,000 direct and indirect jobs. Those jobs will be created in the U.S. instead of Canada. In Alberta, there is already 1.66 million barrels per day of upgrading capacity approved or already under construction and another 1.9 million barrels per day of capacity announced or disclosed for a total of over 3.5 million barrels per day. If the tar sands developments were paced more appropriately, there could easily be adequate bitumen processing capacity in Alberta within a reasonable timeframe. There is no need to be creating additional raw export capacity to the U.S., but with at least five pipelines coming towards the National Energy Board for approval, that is precisely what the province plans to do. The provincial government under former Premier Ralph Klein admitted having no plan. The area where this gap was most profound was in resource revenues. This lack of planning has driven the recent government spending spree and enabled the government to cut taxes. This has created an increased dependence on fossil fuel revenues for the province’s budget; this increases the province’s fiscal vulnerability. It has also exacerbated inflationary pro-cyclical spending by government, exacerbating the boom. Alberta had a savings mentality in the past. When the Heritage Fund was first established under Premier Lougheed in 1976, 30% of annual resource revenue was to be set aside annually for the fund. This was reduced to 15% in 1983, and then to 0% in 1989. Between 1992 and 2006 the value of the Fund was actually eroded; inflation cut it almost in half. Only in 2006 was the fund even protected from erosion by inflation. The current value of the Heritage Fund is approximately $12 billion US compared to $38 billion US for Alaska’s Permanent Fund, while in Norway the fund has reached almost $300 billion US. • to ensure social sustainability. Using these goals as a framework, options are laid out for pacing development, maximizing royalties, maximizing value added jobs, and using fossil fuel revenues wisely to plan for the future. From amongst the options described in the report, the following recommendations are drawn. Pacing private sector development will ease the boom now and reduce the boom-bust cycle. It can be done through a combination of opening up a limited number of construction permits for competitive bidding and getting the price right through internalizing environmental costs for industry. The bids will be chosen on the basis of the highest royalties, best environmental treatment and value added. This combination will enable Alberta to meet vital social goals. This strategy includes counter-cyclical spending recommendations. However, it does not recommend curtailing current public infrastructure spending as there is an infrastructure deficit that needs to be addressed. Due to pro-cyclical spending in the past, there are immediate infrastructure needs. Pacing private sector investment will open up some space for that public sector investment to happen without fuelling the boom or forcing taxpayers to pay a premium due to cost escalation. Royalties should be maximized through a competitive bidding process. A minimum floor should be set that eliminates the generic royalty regime in the tar sands and includes a windfall profits tax of 90% for profits above a 10% rate of return. Because the royalties are based on net profits, voluntary regulation of royalties will need to be replaced by a strong regulatory and enforcement branch with skilled auditors. Corporations that have successful bids for development would have to agree to open their books for audit of appropriate royalty payments. The government should put policies into place to maximize value added jobs generated by fossil fuels. A moratorium should be placed on all additional pipeline export capacity for bitumen. The government should invest in transportation infrastructure including rail lines for transporting value added products to markets. Government should prioritize natural gas for value added processing. This should include reforming the vital supply safeguard to include the provision that no exports be allowed unless there is at least 25 years of proven supply of conventional gas to meet domestic needs. Royalties should be restructured to favour value added in natural gas and bitumen processing. This includes a progressive rate that encourages higher value products with relatively lower rates and charges more at the lower levels of extraction and upgrading. The government should ensure that 90% of resource revenues are kept out of general revenues, and are treated separately, and that an investment and savings framework is established. The revenues will be targeted as follows: 50% will be put into a newly created renewable energies fund; 40% will be invested through the Alberta Heritage Fund in securing the future for education, health care social services, culture and the arts. If taking such a large portion of resource revenues out of the budget creates a deficit, the provincial government should restore the progressive tax system for income – both individual and corporate. There is a wide variety of policy options available to the Alberta government to put the province on a different path. If investment is treated as a means, not an end, fossil fuels can be used to build a future for the province. It is hoped that the strategy outlined in this report will be a starting point for that discussion.